Preserving large connected areas of valuable vegetation types in their natural, or essentially unmodified state, is a complex challenge for planning authorities at a time of rapidly changing climate. Palaeoecological data can shed light on past legacies from previous generations of trees that have influenced forest continuity, species diversity, types and frequency of disturbance, and the extent of the anthropogenic impact, leading to a greater understanding of the circumstances that have forged present communities and in planning for the future. Yet datasets recording ecological processes spanning timescales >50 years are rarely used, even though the life expectancy of dominant trees is usually much longer (Willis and Bhagwat, 2010). Understanding the legacies of past disturbances is of particular importance in European temperate and boreal forests, where forest clearance for agriculture and the disruption of natural animal browsing and fire regimes have been widely recorded from at least the Neolithic period onwards (Whitlock et al. 2017). The timing of significant anthropogenic impact on forests in other regions of the world is comparable or younger, even though some tropical forest case studies have suggested that prehistoric human activities were far more extensive than was once believed (Willis et al. 2018). The major biodiversity values in a current “hotspot” nature reserve, Almeberget, in south-west Sweden (Cover Photo) comprise rare lichens, fungi, bryophytes, and insects associated with Beech (Fagus sylvatica), yet the dominance of this “keystone tree” is a recent development in a dynamic history of largely unbroken forest continuity over the last c. 13,500 years (Figure 1). Reconstructed vegetation and fire histories using pollen and charcoal data, show shifting species combinations and complex mixtures of natural and anthropogenic disturbance. Figure 1. Simplified pollen percentage and charcoal diagram from Almeberget Nature Reserve. Hollow areas indicate the exaggeration of selected taxa x 5. Figure courtesy Gina Hannon. The long-term trends show that there is a range of variability through time, with no single baseline or reference point to use as a target for current management (Bradshaw et al. 2015; Hannon et al. 2018; Hannon, 2019). An early mixed forest between 9500 and 6500 cal. yr BP with frequent low-intensity fires is potentially associated with the greatest diversity of red-listed insect species at this site (Figure 2). Forest continuity and the fragmented reservoir populations of old deciduous trees, together with relatively low-intensity anthropogenic disturbance, are likely to have been critical for the survival of the present-day, species-rich, rare epiphytic flora, wood-inhabiting fungi, and invertebrate communities (Hannon et al, 2018). Many such forest fragments may become more vulnerable with future anthropogenic impacts and climate change. Figure 2. The potential number of red-listed saproxylic insects associated with deciduous trees through time, at Almeberget Nature Reserve. Figure courtesy Gina Hannon. The rather pure Beech forest stands on sites with long continuity of tree cover have become “hotspots” of conservation interest in southern Scandinavia. A recent widespread biotic homogenization has taken place driven by both natural and cultural forces including commercial forestry operations (Seppä et al. 2009; Lindbladh et al. 2014). The replacement of diverse deciduous forests in southern Sweden by monocultures of Spruce (Picea abies) is associated with the local loss of many species of insect, bryophyte, and lichen that are dependent on Oak (Quercus), Lime (Tilia), Poplar (Populus), Alder (Alnus), and other trees (Jonsell et al. 1998). The late-Holocene spread of Beech through northern Europe has also resulted in a reduced tree diversity throughout large areas of forest in Germany and Denmark and this change in forest composition has been driven by combinations of natural and anthropogenic factors (Giesecke et al. 2011; Bradshaw et al. 2010; Bradshaw et al. 2015). Large scale planting programs with Spruce and Pine (Pinus) since the beginning of the 1900s, together with fire reduction, have accelerated the homogenization process creating a crisis for nature conservation. Conservation in forest reserves and National Parks in Sweden is often guided by the presence of threatened “red-listed” species (Brunet et al. 2010; Fritz, 2011). Protection of forest typically involves non-intervention within core areas and encouragement of a variety of suitable substrates such as dead wood in surrounding buffer zones to facilitate the spread of red-listed and other forest species (Halme et al. 2013). This approach may underestimate the importance of disturbance dynamics for the long-term maintenance of important components of forest biodiversity. Currently, protected forests in southwest Sweden have lower tree diversity than in the past, with likely smaller populations of red-listed species (Figure 2). These stands are the natural focus for conservation, but knowledge of the past can be used to suggest some active restoration measures beyond the targets of just protecting the surviving remnants of previous richer systems. Palaeoecological information can form the basis of novel recommendations for conservation management; be compared with modern communities; and be incorporated into management regimes for promoting favorable conditions and in setting practical targets for the future (Jackson and Hobbs, 2009; Anderson et al. 2006; Dietl et al. 2015). In particular, knowledge of how present vegetation communities have developed from earlier conditions and what likely future compositions may develop, is of value to managers in planning pragmatic and successful forest conservation measures. The county of Halland, Sweden, has 5.6% of its area protected in nature reserves and has commissioned palaeoecologists to contribute to appropriate management plans. 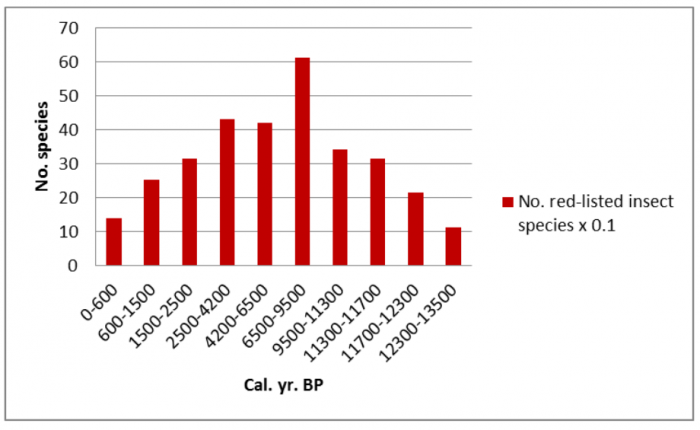 The results of our analysis (Figure 1), have shown that palaeoecological data are not just descriptive records detailing past change, but also provide information about species composition and processes that are highly relevant to the management of present-day ecosystems. This can contribute to the implementation of a number of management measures. The large forest areas dominated by near monocultures of Beech or Spruce are very unusual in a longer time perspective and potentially lack resilience in a period of rapid climatic change. Restoration of former mixed deciduous forest would increase biodiversity and trees such as Lime, Oak, Elm, and Alder should be able to build sustainable populations in the present climate. Their success would depend on the management of the browsing regime and control of deer populations. Fire risk is likely to increase under current climatic trends, but past mixed deciduous forest tolerated a mild regime of ground fires that will disadvantage Spruce and Beech. Research agendas need to move beyond the protected reserves concept and consider novel ecosystems adapted to future climates that may prove to become major threats to biodiversity (Willis and Bhagwat, 2010). These findings are described in the article entitled The reconstruction of past forest dynamics over the last 13,500 years in SW Sweden, recently published in the journal The Holocene. Anderson, N.J., Bugmann, H., Dearing, J.A. and Gaillard, M-J. 2006. Linking palaeoenvironmental data and models to understand the past and to predict the future. Trends in Ecology & Evolution 21(12), 696–704. Bradshaw, R.H.W., Lindbladh, M. and Hannon, G.E. 2010. The role of fire in southern Scandinavian forests during the late Holocene. International Journal of Wildland Fire 19, 1040–1049. Bradshaw, R.H.W., Jones, C. S., Edwards, S. J. and Hannon, G. E. 2015. Forest continuity and conservation value in Western Europe. The Holocene 25 (1), 194–202. Brunet, J., Fritz, Ö and Richnau, G. 2010. 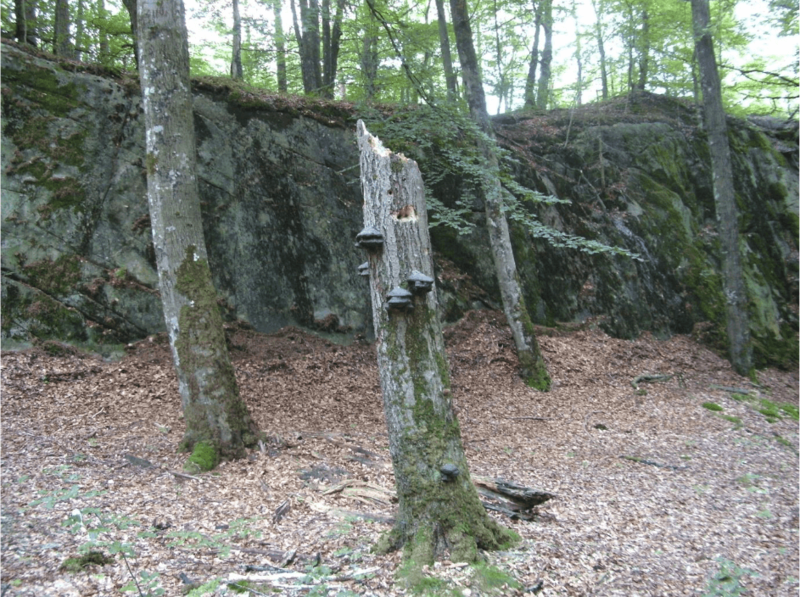 Biodiversity in European beech forests – a review with recommendations for sustainable forest management. Ecological Bulletins 53, 77–94. Dietl, G.P., Kidwell, S.M., Brenner, M., Burney, D.A. et al. 2015. Conservation Paleobiology: Leveraging Knowledge of the Past to Inform Conservation and Restoration. Annual Review of Earth and Planetary Sciences 43, 79–103. Fritz, Ö. 2011. Lunglav minskar och bokfjädermossa ökar i Hallands bokskogar. svensk Botaniskt Tidskrift 105, 163–177. Giesecke, T., Bennett, K.D., Birks, H.J.B., Bjune, A.E. et al. 2011. The pace of Holocene vegetation change e testing for synchronous developments. Quaternary Science Reviews 30 (19–20), 2805–2814. Halme, P., Allen, K.A., Auniņš, A., Bradshaw, R.H.W. et al. 2013. Challenges of ecological restoration: Lessons from forests in northern Europe. Biological Conservation 167, 248–256. Hannon, G.E. 2019. Long-term processes at Almeberget Nature Reserve: a ’hotspot’ forest of high conservation interest. Report for Halland County Authorities. (in press). Hannon, G.E., Halsall, K.M., Molinari, C. et al. 2018. 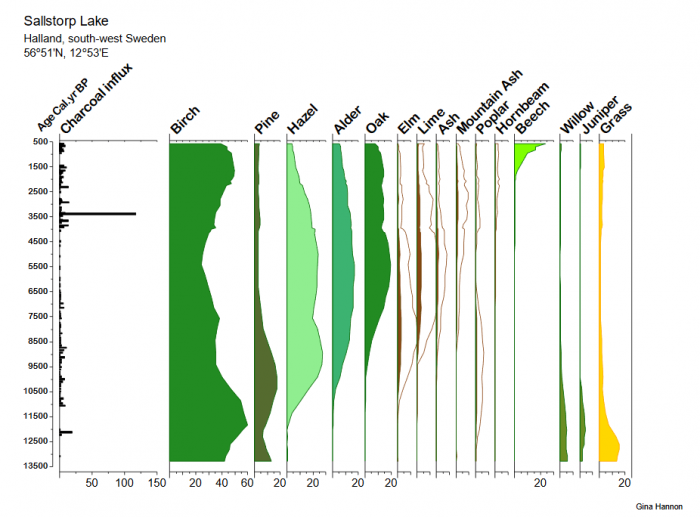 The reconstruction of past forest dynamics over the last 13,500 years in SW Sweden. The Holocene 28 (11), 1791–1800. Jackson, S.T. & Hobbs, R.J. 2009. Ecological restoration in the light of ecological history. Science 325 (5940), 567–569. Jonsell M., Weslien J. and Ehnström B. 1998. Substrate requirements of red-listed saproxylic invertebrates in Sweden. Biodiversity and Conservation 7 (6), 749–764. to spruce – The borealization of southern Sweden. Scandinavian Journal of Forest Research 29(7), 686–696. Seppä, H., Alenius, T., Muukkonen, P. et al. 2009. Calibrated pollen accumulation rates as a basis for quantitative tree biomass reconstructions. The Holocene 19, 209–220. Whitlock, C., Colombaroli, D., Conedera, M. & Tinner, W. (2017). Land-use history as a guide for forest conservationand management. Conservation Biology 32 (1), 84–97. Willis K.J. and Bhagwat, S.A. 2010. Questions of importance to the conservation of biological diversity: answers from the past. Climate of the Past 6 (6), 759-769. Willis, K.J., Jeffers, E.S and Tovar, C. 2018. What makes a terrestrial ecosystem resilient? Science 359(6379), 988-989. Richard Bradshaw is a research scientist and professor of geography and planning at Liverpool University.